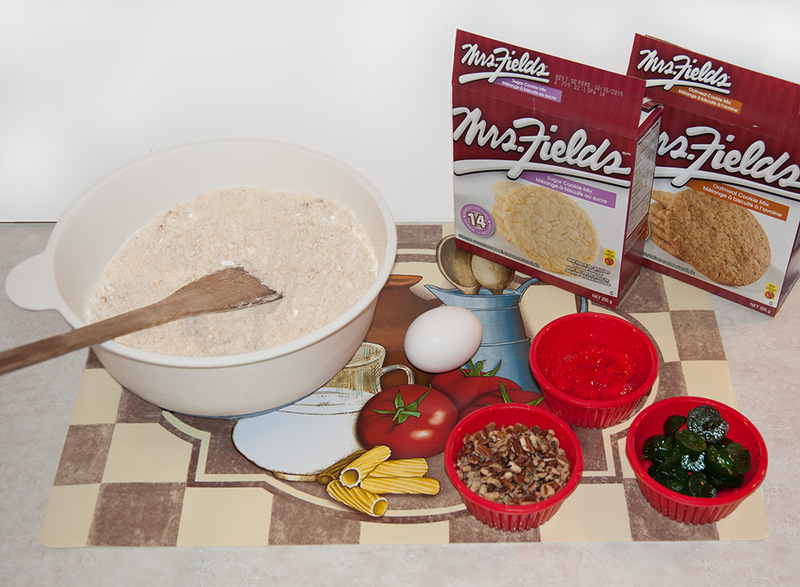 I really wanted to title this post "Baking with Mrs. Fields", although I didn't because I thought it might be just a little misleading (after all, I am obviously not "Mrs. Fields"). 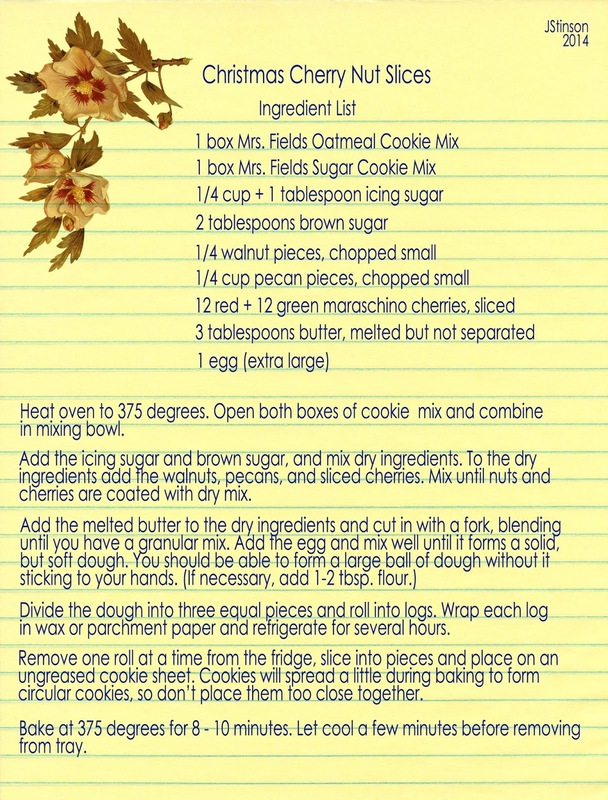 This recipe begins with two boxes of Mrs. Fields cookie mix - one sugar cookie mix, and one oatmeal cookie mix. (You can download the recipe page, or print it from below). When I bake (especially Christmas cookies), I always use our old family recipes but neither my mom, nor my grandmother had a recipe for these cookies. Well, not these cookies exactly, because the recipe I have is a little different, but the Cherry Nut Cookies are popular on most Christmas trays because of their colouring - a whitish dough with red and green cherries makes for a festive addition to cookie plates Some have nuts, some do not, and there are several different recipes available for these (just search the web and you'll find dozens). When I came up with this recipe I was looking for a similar idea, but not the exact same cookie. So, what to do? I can make up my own recipes for meals and casseroles - most women who cook do that without even thinking (mostly to use up leftovers), but when it comes to baked goods ... well, not so much. For me that takes some trial and error, but I'm happy to report that this recipe worked out very well the first time around and I'm delighted to say that my husband (who is not much of a cookie hound) really, really liked them. He ate one as it was cooling ... and came back right away for another. That's rare for him when it comes to cookies. I can usually get him to test one, but unless it's one of his favourites (peanut butter cookies, or shortbread bars), one is all he'll eat. I had to hide the cookie tin for these after I was done. ready-made mixes, but you aren't going to be following the instructions on the boxes. 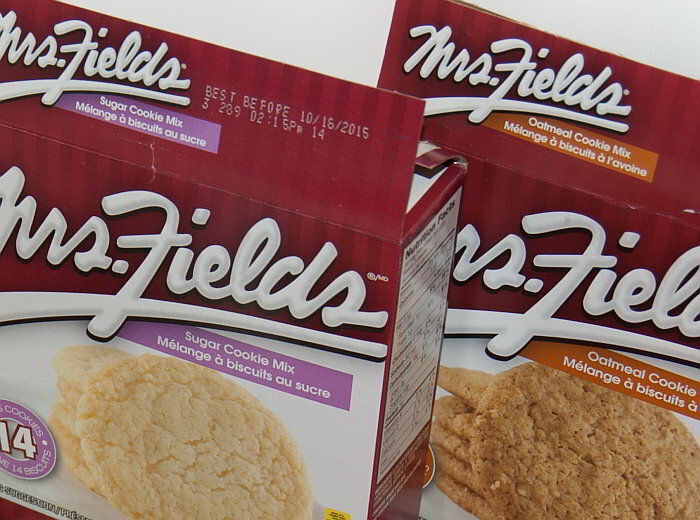 Oh - as for why Mrs. Fields mixes ... have you ever had a Mrs. Fields cookie? They're good, with a very home-made taste and texture and because they sell these boxes of cookie mix in the dollar store, so the cost for the base ingredients for 5 dozen cookies was $2! Open both boxes, and dump the mixes into your mixing bowl. Add the icing sugar (1/3 cup + 1tbsp), the brown sugar (2 tbsp), and the additional flour (2 tbsp). Mix the dry ingredients together. Slice 12 red and 12 green cherries into small pieces, measure chopped walnuts and pecans (1/4 cup each) and add these all to the dry ingredients. Mix them up till they're coated well with dry ingredients. Melt 3 tablespoons of butter (not margarine) just to the point where it's melted (and not to the point where it's separated into solid and liquid). 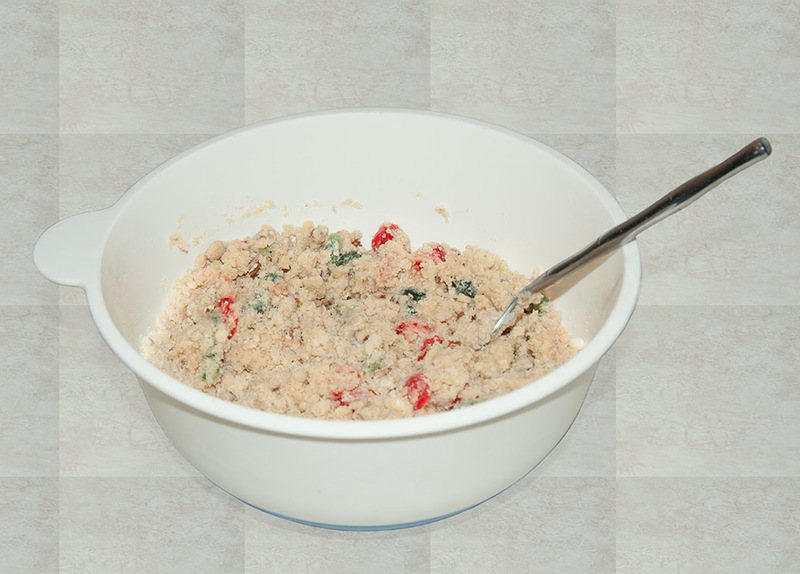 Pour that into the dry ingredients, and use a fork to cut it into the mix, as if you were mixing up a pie crust. The result is a crumbly, granulated mixture. 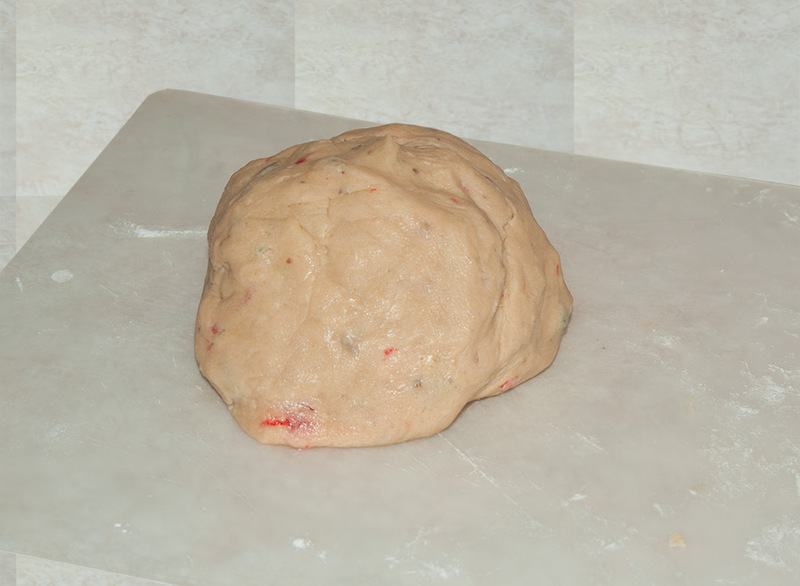 Add the egg and mix until the dough forms a slightly stiff, but soft ball. This stage is the hardest to judge, but you should be able to roll the dough into three narrow "logs" without the dough sticking to anything. If yours is still a little sticky, toss a tablespoon of flour onto the counter, board or paper you are rolling it on and knead it gently to mix it in. 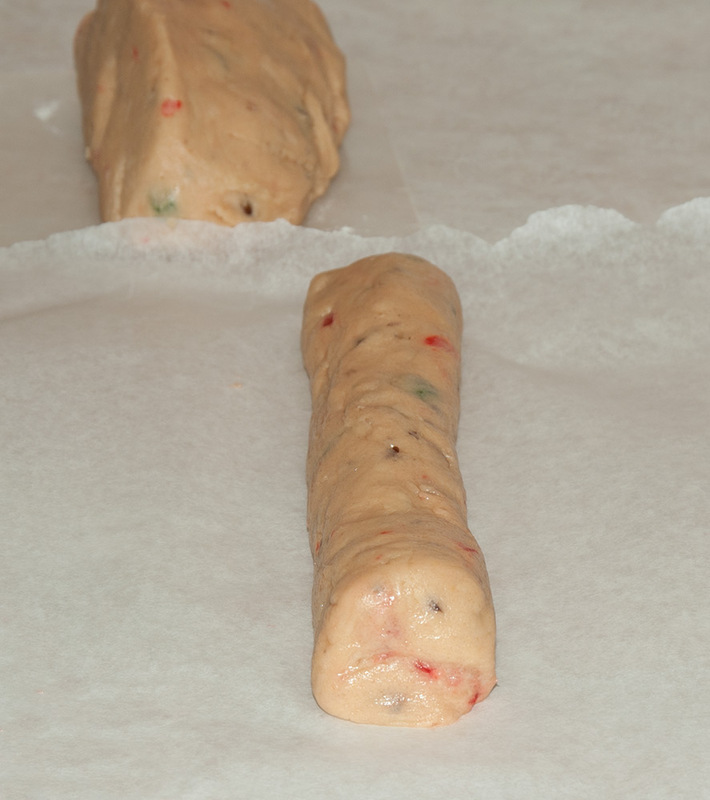 Roll each log in wax or parchment paper and refrigerate for several hours (can be left overnight if you prefer). When you remove the logs from the fridge, they'll feel "hard" and you should be able to cut these with a sharp knife into slices. 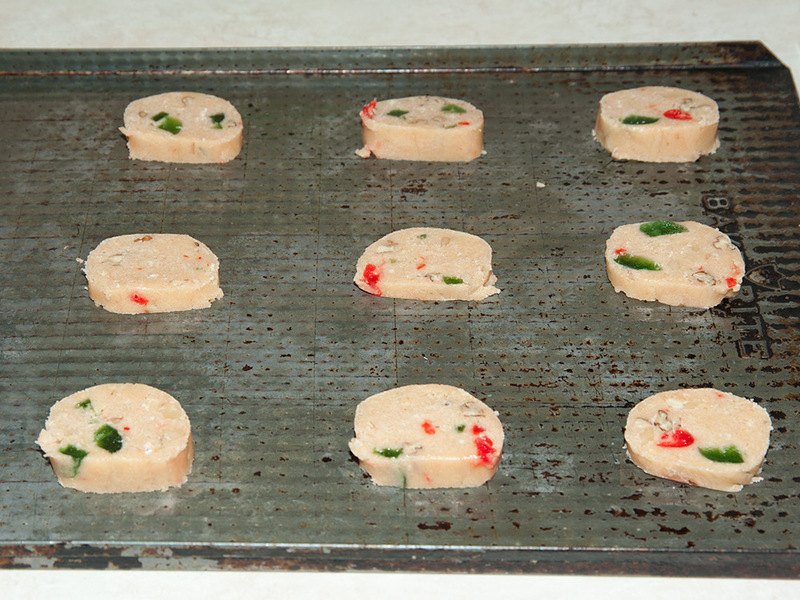 Place on an ungreased cookie tray and bake at 375 degrees for 8 to minutes. Wait 3 to 5 minutes before removing the baked cookies from the tray. Let cool completely before placing in tins or storage containers. 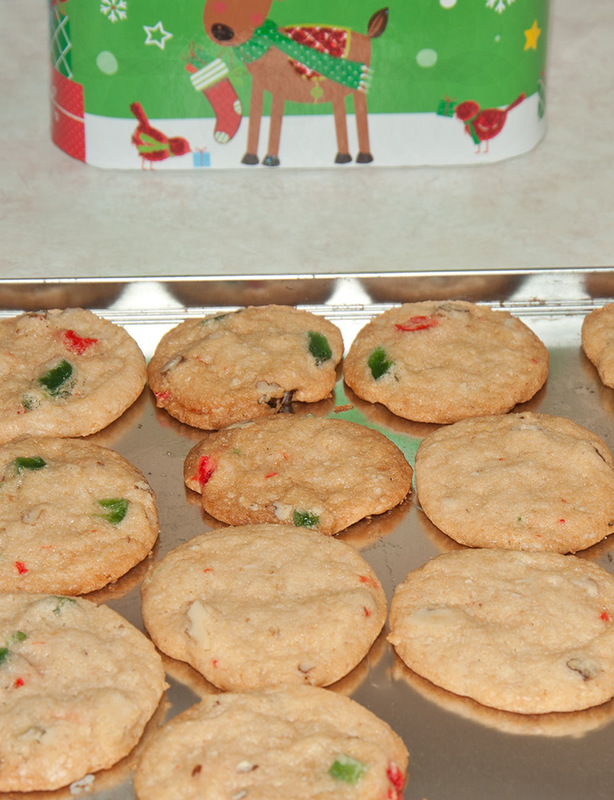 Although the cookie boxes indicate that each mix will make up to 14 cookies, The result from this recipe was 5 dozen smaller cookies (about 2.5" to 3" in diameter), which is just the right size for putting into small gift tins or on mixed cookie plates. Nobody really wants gigantic cookies at Christmas, right? Honestly, most of us like to sample all the different cookies offered, meaning small bites let you try different cookies. (*NOTE: if you do want larger cookies, make 2 larger diameter logs instead of 3 narrow ones).